Once your business is established with 5 or more employees, you may be starting to ask yourself, how do you manage a business? There’s a huge amount of information to learn about business management and business growth strategies, so where do you start without attending online business courses? Managing a business is not the same as operating a business. Managing a business is about increasing its efficiency, which in plain English means, increasing profits, but not necessarily sales. 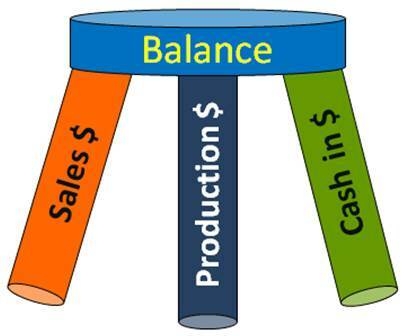 Increasing the net profit margin is what business management is all about. This is covered extensively in our Academy of Business Mastery 7 month small business course online. A shorter yet more sales and marketing orientated business growth strategies course is Double Your Profits. Any business can increase its profits, without increasing its sales. Yet how many businesses focus on this incredible opportunity? The banks do, that’s why they hit record profit levels, even during a GFC time. What does that tell you about their management skills? Increasing profit margins is not about increasing leads, unless those leads cost zero or much less than other marketing sources. Increasing net profit margins is about being smarter, finding short-cuts to tasks, using technology and other strategies. However, these are the common ones, that yes, get a result at one level, but wouldn’t it be far more exciting to double or even TRIPLE your business profits, without spending a dollar more on marketing? Have this got your attention? Let’s take a walk through some of the ingredients of business management and what thinking behind the strategies you need to rapidly increase the profit margins. These 3 skills, when all combined can literally transform it – increasing cash flow, profitability, employee performance and more. You have people working for you, customers are people, suppliers are people and you’re one of the people. It kind of makes sense then to learn about people in business. Doing so reduces frustration, frees up your time, increases your profits (from better sales skills) and so much more. People skills are the least developed skill and the most beneficial one in the majority of businesses. What do you measure in your business? Everything! If it moves, measure it! The first is winning the sale, using marketing and selling skills. The second is carrying out the service in regards to the sale. The third is being paid for the work. How well you are “managing” all 3 legs, in terms of bringing in the dollars for each one, is seen by how much certainty you have with every decision to grow your business. Measuring these weekly – your leads, sales income, average $ sale value, number of sales, and conversion rates. You also need to measure your service work – i.e. ‘production’ every week, to see what dollar value of work has been worked on (finished or not), what the costs on every sale was (technical employees included as well as materials/products). Measure the gross profit on every sale (Income – costs related to the sale) and then divide the gross profit into the sale price to determine the gross margin (gross profit percentage). And finally you need to measure your cash in, cash out, cash balance and what’s owed. Why measure all these every week? Great question. It’s so you eliminate your stress caused by, not having enough sales, having too many to handle or not having enough cash in the bank. By measuring all 3 “leg”s of the stool, you can BALANCE your business and see what’s coming weeks before you do stress in response to it. Not measuring all 3 legs means you are completely flying blind, with no warning problems are about to occur. When they do, you are already busy, so the solutions to them tend to be “quick fixes”. The stress keeps on coming! This video can show you the path to permanently solving your challenges in business. ALL challenges, not just some of them. The video will show you how to access a FREE measuring Tool. A simple, but super powerful one that shows you what to measure and why. Growing a business, or managing a business is all about the numbers. Numbers are the “glue” that keep your staff using the systems you put in place. Measuring and systems give your business the necessary structure to grow, fast, year after year (as some of our clients have, added millions to their sales each year for year after year). Measuring reveals the profit opportunities and profit “leaks”, you don’t know your business has. Every business leaks profits and only by insightful measuring and using specific measuring tools will you find these opportunities and leaks. Your business is like this blue bucket. The size is like the size of your turnover (annual income). 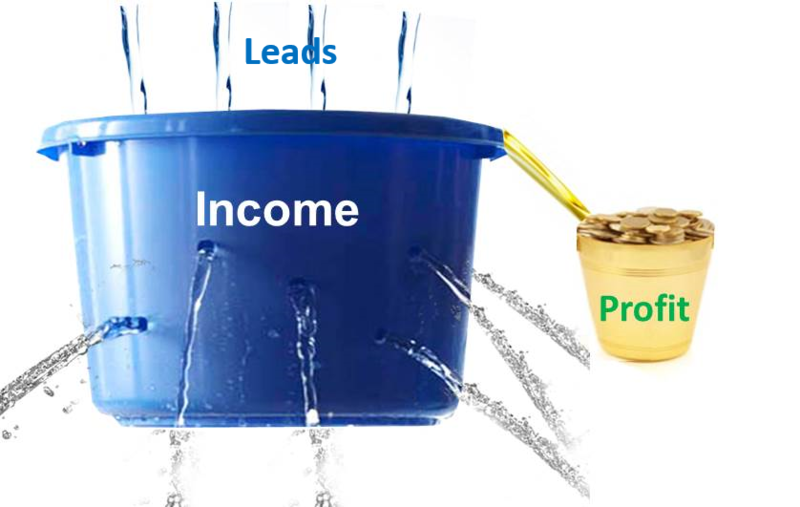 The gold bucket is the profit bucket, represented by the size of your business’ net profit. The relationship between the 2 buckets is like the Net Profit Margin of your business. The net profit margin is calculated by diving your net profit into your turnover (yearly figures). Its a percentage and in 90% of all businesses, its too low at under 10% (once the business has reached $700,000 in annual income). Looking at this picture, would it be wise to to put more water into the blue bucket, or to plug the leaks? Plugging the leaks is easier, you just need to know where to find them. Measuring is how you find them in a business. Advanced measuring, not just of your sales and marketing where small leaks can be found, but in your service delivery where the majority of your employees are. Measuring people increases accountability and accountability lifts people’s performance. Just look at sport and how much people lift when the competition is at its toughest? People need accountability to perform at their best. Your employees are no different. To measure, you may need a spreadsheet. Yes, you can pay other companies for their tools, which can cost $15,000 per year, or you can get the training you need to understand the tools and get all the tools you need to manage your business, to measure all 3 legs (and more), to use forever for free, while attending the Academy of Business Mastery course. This course has it all. Training on all 3 legs, training on systems, people and measuring skills and more. It can and has transformed hundreds of business owners lives, because these topics discussed in this blog are all aspects of the 7 month intensive training. Before you consider the cost of it, ask yourself what it costs you to not be operating with a net profit margin that is 5% to 15% higher (as our clients’ businesses regularly achieve), or the price of your family not being able to have 100% of your attention at night or weekends because you’re thinking about your business. Or the cost to your own health for being under pressure and stress. What price do you put on these? The good news is, because the Academy of Business Mastery is delivered live in small groups (online and offline), you aren’t paying like you would a business coach with 18 years of experience (where the fee is $3,000 to $4,000 per month for 12 months). The business Academy was created for every day business owners, who wanted top quality information, but most of all tools and systems, ready to implement. Find out more by getting in contact with our office, or subscribe to receive our free video newsletters to find out more, or to enroll for our online business course. If you don’t feel you’re ready for our complete Business Academy, then check out our Double Your Profits video training course. Its an awesome business growth strategies course for businesses with less than three years of trading, or even ones with more.